Brigadier General James H. Dienst is the Director, Education and Training, Defense Health Agency, Defense Health Headquarters, Falls Church, Virginia. He directs the joint development and sustainment of Department of Defense (DoD) medical training initiatives and academic policy, leading 509 staff across two regions with an annual operating budget of $61.5 million. He is directly responsible for three medical institutes that graduate over 20,000 enlisted medical personnel annually, provide combat trauma and joint medical operations training to over 260K DoD personnel, and provide leadership training opportunities for approximately 10,000 current leaders of military healthcare organizations. General Dienst also serves as the Chief, Biomedical Sciences Corps, United States Air Force, overseeing the professional force development and world-wide utilization for more than 2,400 officers in 18 healthcare specialties supporting 75 medical treatment facilities and various Headquarter and Major Command organizations. General Dienst is originally from Wichita, KS. He was commissioned into the Biomedical Sciences Corps in 1995 and has served in a broad range of assignments within base, Major Command, Headquarters Air Force (HAF), and DoD levels. 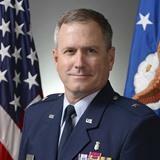 In addition, he has served as a commander at the squadron and group levels, attended Air War College in-residence within the USAF Center for Strategy and Technology Blue Horizon’s Program, and served as a DoD Joint Task Force and HAF medical operations division chief. Prior to this assignment, General Dienst served as the Command Surgeon, Headquarters, Air Force Reserve Command.